Snoring Treatment In Hyderabad | What Causes Snoring? Snoring is noisy breathing, loud and harsh, that occurs while sleeping. The sound occurs when there is an obstruction to the free flow of air through the passages at the back of the mouth and nose. Snoring can happen at any stage of sleeping. About half of the people snore at some point in their lives. About 40 percent of adult men and 24 percent of adult women are habitual snorers. Snoring is most commonly seen in men, than in women. It is more common as you get older. Men become less likely to snore after the age of 70. Snoring sound increases as the airway is narrowed down. When the airway is narrowed, the airflow becomes more forceful which increases the tissue vibration and further causes snoring to grow louder. Being a man: Snoring is most commonly seen in men than in women. Overweight: Overweight or obese people are more likely to snore. Presence of a narrow airway: People with a long soft palate, or large tonsils or adenoids, have a narrow airway which cause snoring. Drinking alcohol: Alcohol relaxes the throat muscles, increasing the risk of snoring. Nasal problems: Any structural defect in your airway, like a deviated septum, or a chronically congested nose may increase the risk of snoring. Family history of snoring or obstructive sleep apnea: Heredity is also a potential risk factor. Snoring may be a sign of more serious condition called obstructive sleep apnoea (OSA), which can lead to serious, long-term health problems. To rule out sleep apnoea, snorers should seek immediate medical advice. An otolaryngologist will provide a thorough examination of the nose, mouth, throat, palate, and neck, using a fibreoptic scope. 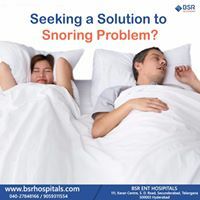 An examination can reveal the cause of snoring which may include nasal allergy, infection, nasal obstruction, or enlargement of tonsils and adenoids. A sleep study in a laboratory or at home is necessary to determine if snoring is due to OSA. Treatment of snoring depends upon the diagnosis and levels of upper airway narrowing. Diagnosis plays an important part in the treatment of snoring. For snoring associated with OSA, oral appliances are recommended. Form-fitting dental mouthpieces help to advance the position of your jaw, tongue and soft palate to keep your air passage open. This should be fitted by an otolaryngologist, dentist, or oral surgeon with expertise in sleep dentistry. Continuous positive airway pressure (CPAP): This approach involves wearing a mask over your nose or mouth while you sleep. The mask directs pressurized air from a small bedside pump to your airway to keep it open during sleep. CPAP eliminates snoring and is most often used to treating snoring when associated with OS. Uvulopalatopharyngoplasty (UPPP) is surgery for treating snoring. It removes the excess soft palate tissue and opens the airway. In addition, the remaining tissue stiffens as it heals, thereby minimizing tissue vibration. The size of the air passage can be further enlarged by adding tonsillectomy to the procedure. Thermal ablation procedures reduce the tissue bulk in the nasal turbinate, tongue base, and soft palate. Different methods of thermal ablation include bipolar cautery, laser, and radiofrequency. These procedures can be performed in an operating theatre or during an office visit. Stiffness of the soft palate can also be increased without removing the tissue by injecting an irritating substance that causes stiffness in the injected area near the uvula. Insertion of stiffening rods (Pillar implants) into the soft palate increases its stiffness which helps in reducing snoring. Significant weight loss can also improve snoring in some patients. Adopting a healthy and athletic lifestyle to develop good muscle tone and lose weight. Avoiding tranquilizers, sleeping pills, and antihistamines before bedtime. Avoiding alcohol for at least four hours and heavy meals or snacks for three hours before retiring. Sleeping on your side rather than your back. Elevating the head of your bed four inches. BSR ENT Hospital is one of the renowned ENT Specialist Hospitals in Hyderabad and Secunderabad with a high success rate of surgeries and clinical outcomes, since the past 40 years. We are equipped with the latest technologies, such as a sleep laboratory to treat snoring and sleep apnoea. We also have our own inhouse diagnostics to help our patients save the effort of going elsewhere for tests. This also helps speedup treatment of patients. Trained and experienced ENT specialists are skilled at delivering the best in treatment solutions for all ENT disorders. We take a comprehensive approach to treatment, integrating advanced therapies including rehabilitation, medical management and surgical repair. We are a trained and experienced team of specialists, radiologists, surgeons and advanced practice providers who utilize the latest technologies to diagnose and manage disorders. We strive to provide the best treatment solutions with utmost care and compassion at affordable price. We care about our patients and therefore our doctors spend time with patients to provide complete information on the condition and the proposed treatment plan before beginning the treatment.